On receiving your Quinlans Smoked Salmon open the presentation box and examine the vacuum packed pouch – check to see that it is airtight and sealed completely. Once you are satisfied with the condition of the smoked salmon place in a refrigerator at a temperature between 0 and 4 degrees. The smoked salmon will last for 30 days in your fridge. Once the pack is open, Quinlans smoked salmon will keep in good condition for up to seven days in a refrigerator. Re-wrap the salmon very well in either the original pack, in foil or in a polythene food bag to prevent it from drying out. Always refer to the best before label and never consume the smoked salmon once this date has expired. Slicing Kerryfish’s wild smoked salmon. Our smoked salmon is available pre-sliced for your convenience. 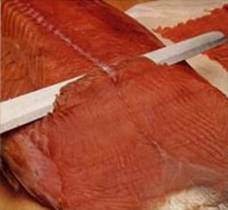 To slice the smoked salmon yourself first trim off the fins and fatty tissue – this will ensure easier slicing. Slice the flesh horizontally in paper thin pieces working from head to tail. To get the full benefit of the rich full flavour of Quinlans smoked salmon, serve at room temperature, allow 55-75g per person. See our recipes for serving suggestions.